Adelheid Lang - mezzo-soprano, Christian Hilz - baritone Chamber Music Ensemble by Erlanger Musikinstitut e.V. Following Nouveautés and Chamber Music Eberhard Klemmstein now presents his latest CD in this series under the name of Chamber Music for Larger Ensembles. On the whole it is conspicuous that he prefers to write music for standard combinations which can be integrated simply into normal concert programs. The CD opens with a nonet for wind and string instruments. The next piece is a fantasy for such a large group of solo strings (8 violins, 3 violas, 3 cellos and double-bass) that it touches the border between chamber music and chamber orchestra. With the quintet for piano, 2 violins, viola and cello we return to a standard setup. The following cantata after poems by Erich Kästner is an unusual combination, with two of the four poems for baritone and the other two for mezzo soprano. The accompaniment is made up of 2 trumpets, trombone, piano, percussion, 3 violins and two cellos. 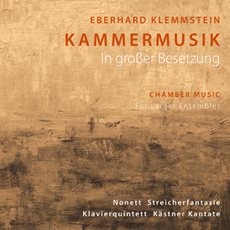 As far as style is concerned, Klemmstein is urged by a commitment to tonality and creates a wide spectrum of moods and unusual nuances that effectfully play with the expectations of the listener. Klemmstein’s striving is to invent memorable melodies and comprehensible rhythms. For all that, he attains a personal musical language which is equally appreciated by audience and musicians. This clearly shows how our present times don’t follow a defined style and are open in all directions.